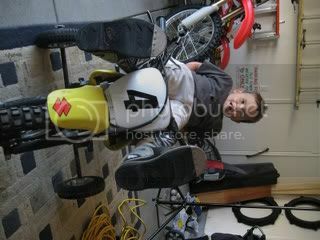 Jacob has been riding a little bit since he was around 3 1/2 with training wheels. Well we could not find any boots in his size so I was always a little stressed even though he was little and going slow. He had surgery recently and could not ride for quite awhile so we held off on ordering him gear. Today he received his first motocross boots and he is one excited little boy. he was waiting for the delivery and once it came he was freaking out jumping around while I opened them up. Cannot wait to take him to the track this next week. WOOHOO! It is too cool to see your kid get so excited about riding! Last edited by Imahoot393; 06-07-2007 at 07:06 PM. 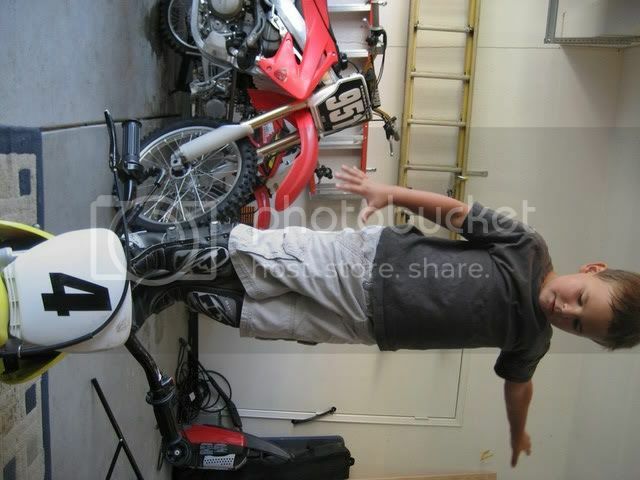 Ummm...I so hope he is not going to be into FMX. Last edited by Imahoot393; 06-07-2007 at 07:20 PM. Well at least you took some pics! Atta gurl! And I'm with you on the FMX thing. Yeah the funny thing is that I don't like to take staged pics of my kids. I never position them or move them where I want. I was barely ready with the camera when he started freaking out doing stunts. OMG I was laughing my head off. So sorry about the quality but it was too good to pass up with my little point and shoot camera. I love it... that is just too cool! Doesn't looks very excited to me! You guys are going to have so much fun! Ok I think him and Jude have allot in common! 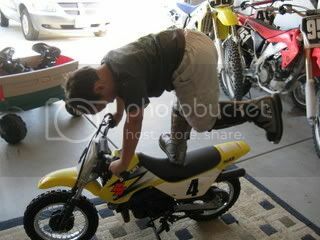 Thats the same stunts Jude did when he got his gear! LOL He even wanted to sleep in his helmet! Even still he asks silly questions about sleeping with certain "gear" on. You got such a cute boy!! I LOVE THE LAST PICTURE! Congrats Jacob!!! He is going to feel like such a big kid at the track. Don't that make you wish you had the energy a kid has and the sheer enthusiasm for something they have. Nice post Tina. Heck Yeah You Go Boy!! Josh and Tina That's too Cool!! mxm- I knew other parents would understand all that excitment. Jude and Jacob huh? I bet there are going to be some funny stories down the line just like the other kids here that crack us up. Florida and OSF- Yes we are very excited to see him get out there. Yes Bill, that energy would be so nice. He is a very sporty kinda kid and I think he will grasp it quick from just seeing him out there when he was smaller. Now we just need to get those darn training wheels off. Because of his surgery we have had to wait to even get him back on his regular bike. He seems ready so we shall see if we can get those things off or not soon.